It’s amazing that the Trump administration’s toxicity is so great that merely not being in it counts as a PR victory. Before the administration began, it was enough to somehow render George W. Bush from war criminal to cuddly old dunderhead in a raincoat; it has imbued Steve Bannon with such vigor that he is undertaking a goddamn juice cleanse; and Sean Spicer, onetime figurehead for the administration’s obstinate counter-factuality, is now a Dancing With The Stars sweetheart, and is making friends with SNL. Now his rehabilitation tour continues with a long-awaited meeting with the pope. 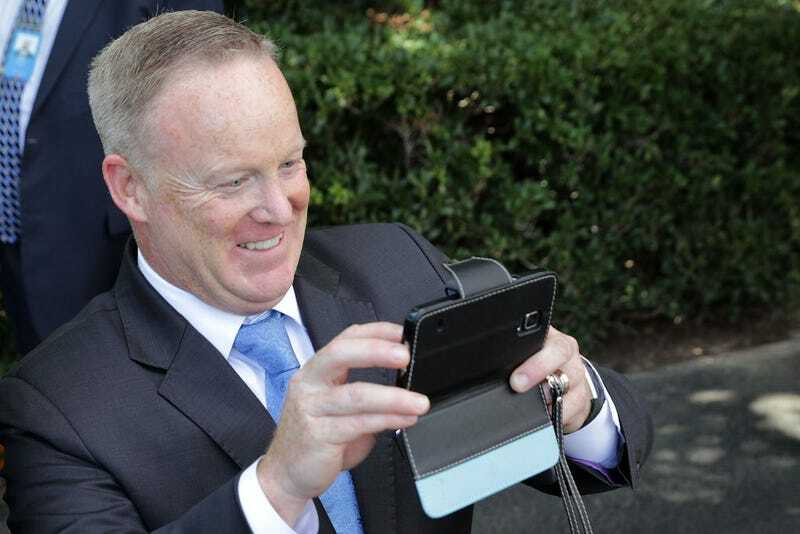 You may recall that Spicer was shut out of Trump’s May tête-à-tête with the the pope, presumed at the time to be a punitive measure as a result of Trump’s displeasure with Spicer’s performance as press secretary. An anonymous source at the time said of the snub, “Wow. That’s all (Spicer) wanted.” Incidentally, the pope did not seem exactly stoked to be meeting Trump, passive-aggressively gifting him a book on the realities of climate change and scowling in their photo op together. Joke’s on Francis, though: Trump doesn’t read! Anyway, in a meeting with other politicians this week, Spicer finally got some face time with Pope Francis, a.k.a. the Chill Pope. Photos on the Vatican’s image service showed the two talking, and you can even see him taking a photo in a post to the Vatican Radio’s Facebook page. Sure, sure, we’re all friends now. This guy did defend Trump’s most doggedly authoritarian tendencies and lobbied aggressively to erode the power of the press in the White House—limited as it may have been to begin with—but yeah, good for him. Everyone should meet the pope who wants to, or whatever.